Atlantic recording group, HALESTORM, has announced details of their forthcoming new album. Into The Wild Life will be released in Europe on April 3rd, in the UK on April 6th, and in North America on April 7th. Pre-orders will launch at midnight tonight. Into The Wild Life marks the band’s third studio album and follow-up to 2012’s The Strange Case Of.... Recorded last year in Nashville with Grammy-nominated producer Jay Joyce (CAGE THE ELEPHANT, ERIC CHURCH) at the helm, the album is heralded by the single "Apocalyptic", which is streaming below. "Apocalyptic" will be available to buy on iTunes from midnight tonight, and also as an ‘instant grat’ for fans pre-ordering the new album. 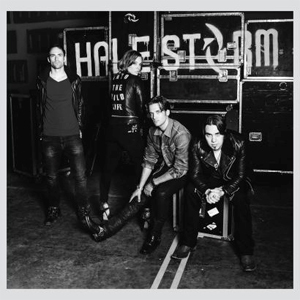 HALESTORM have announced UK and European headline tour dates for March and April 2015 in support of the new album.